Bread spread with 33% malty beverage powder Ovomaltine. Produced in Switzerland. Enjoyed all over the world. 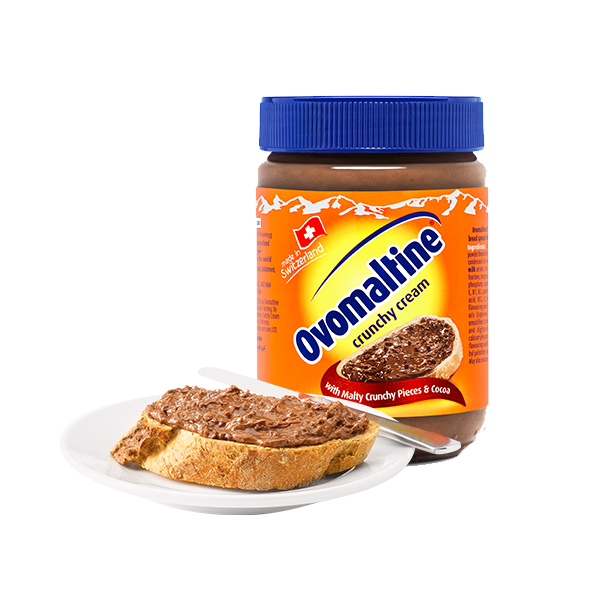 Try Ovomaltine Crunchy Cream on your bread roll, croissant or crêpe and use it as an ingredient for your cakes, pastries and ice cream. What makes Ovomaltine Crunchy Cream so special? Two things make our Ovomaltine Crunchy Cream irresistible. The first is, of course, the incredibly crispy Ovomaltine bits and the smooth texture of the spread - Ovomaltine is the only product that combines the crunchy with the creaminess. And the second reason why Ovomaltine Crunchy Cream is sooooooo tasty? It is the unique combination of malt and cocoa. Store away from direct sunlight in a cool, dry place. Do not refrigerate. 33% malty beverage powder Ovomaltine (barley malt extract, condensed skimmed milk, condensed milk serum, fat-reduced cocoa powder, sugar, fructose, mineral (magnesium carbonate, dicalcium phosphate), rapeseed oil, vitamins (A, E, C, thiamin, riboflavin, niacin, B6, folic acid, B12, biotin, pantothenic acid), salt, flavouring vanillin), sugar, vegetable oils (rapeseed, palm), hazelnuts, emulsifiers (sunflower lecithin, mono- and diglycerides of fatty acids), mineral dicalcium phosphate, fat-reduced cocoa powder, antioxidants (ascorbyl palmitate, alpha-tocopherol), flavouring vanillin.